The Catholic conception of priesthood, defined by the Council of Trent and reiterated by the Second Vatican Council with fresh attention to the testimony of Sacred Scripture, has come into crisis in the post-conciliar era. The great number of those who have left the priesthood and the enormous decline in priestly vocations in many countries certainly cannot be attributed to theological causes alone. The extra-ecclesial causes, however, would not have been nearly so influential if the theological foundations of the priestly ministry had not been discredited among many priests and young people. In the new cultural situation which has evolved since the Council, the old arguments of the 16th century Reformation, together with more recent findings of modern biblical exegesisówhich moreover was nourished by the presuppositions of the Reformationó acquired a certain plausibility, and Catholic theology was unable to respond to them adequately. What are these arguments? We might first of ail mention a terminological consideration which emerges from a more careful study of Sacred Scripture. The Early Church employed profane rather than sacral terminology when referring to its ministries. There is no evident continuity between these ministries and the priesthood of the Mosaic Law. Moreover, these ministries, which for a long time were not very clearly defined, assumed a variety of names and forms. Only towards the end of the first century was some clarity reached regarding the form and content of the ministries, although the process of definition had not yet come to an end. It is, however, of great significance that the cultic function of these ministries is nowhere explicitly mentioned. These ministries are never explicitly linked with the Eucharistic celebration. The preaching of the Gospel appears as their primary function. together with a variety of other services for the life of the Christian community. The theory has been derived from this fact that the ministries of the nascent Church were not at that time viewed in terms of sacrament, but only in terms of function. To these observations may easily be linked a certain theory which says that the Christian faith restores the profane world, that its real intention was to thoroughly remove everything sacredóa theory whose aim is to develop fully and apply the views of Karl Barth and Dietrich Bonhoeffer on the opposition between faith and religion. inviting us to go out to Him there (Heb 15:13f). Against the real intent of these words, which express a profound theology of the cross, it was rather said: At the moment of Jesus’ death, the veil of the temple was rent. There was no longer any separation between temple and world, between the sacred and the profane. The death of Christ in the midst of the world shows us that acts of love performed in the midst of life can be the only legitimate liturgy in the New Testament era. Such views derived from modern exegesis somehow presuppose hermeneutical decisions developed in the period of the Protestant Reformation and endow them with new force. A basic key in the new reading of Scripture which has been born in these times must be found in the opposition between Law and Gospel which was deduced from Pauline theology. The Law which has been abolished is opposed to the Gospel. Priesthood and cult (sacrifice) would seem to belong to the category of law: the Gospel is said to express itself in the figure of the prophets and in the preaching of the Word. For this reason the categories law-priesthood-sacrifice-cult acquire a negative connotation because they lead man to the letter that kills and to works which cannot justify. The essence of the Gospel, on the contrary, would consist in the hearing of the Word and in faith, which alone can render a man just. Thus the figures of the prophet and of preaching are alone congruent with the Gospel, while priesthood would pertain to the Law and should be thoroughly excluded from the Church of the New Testament. It was this perspective that thoroughly determined the course of modern exegesis, and it shows through at every point. From it the above-mentioned terminological observations took their force. Catholic theology, which since the Council has accepted modern exegesis almost without argument, was unaware of its hermeneutical key and was thus unable to respond to the great questions to which it would give rise. And so the crisis we spoke about at the beginning was born. In the meantime the work of theologians is beginning to acquire a more balanced view of these questions. It should not be forgotten that already in the 16th century, after the initial conflicts, the beginnings of a new balance appeared. The ordination to the ministry of preaching among Protestants began after a short time to be seen analogously to a sacrament. Likewise. the connection of the ministry of preaching with the ministry of the Eucharistic celebration once again came to light. Even though the term “priesthood” was avoided in the tradition of the Confessions that sprung from the Reformation, the ministry of the Word as sacrament was restored in various ways on the basis of New Testament evidence. For this reason, ecumenical dialogue has indeed opened a path as well by which the hermeneutical key for a correct understanding of Sacred Scripture can be better defined and the foundations of the Catholic doctrine of priesthood are brought to light in a new way. In this sense I would like to show briefly how this doctrine clearly emerges from the witness of Scripture. also necessary to learn to perceive properly the unity of salvation history as it progresses in the Old and New Covenants. In its very novelty, tie message of Christ and His works together fulfil everything that went before and form a visible centre which brings God’s action and us together. If we seek the true novelty of the New Testament, Christ Himself stands before us. This novelty consists not so much in new ideas or conceptionsóthe novelty is a person: God, who becomes man and draws human beings to Himself. Even the question regarding what the New Testament has to say about priesthood should begin with Christology. The so-called Liberal Age interpreted the figure of Christ on the basis of its own presuppositions. According to its interpretation, Jesus set up pure ethics in opposition to ritually distorted religion; to communal and collective religion He contrasted the freedom and responsibility of the individual person. He Himself is portrayed as the great Teacher of morals who frees man from the bonds of cult and of rite and without other mediations sets him before God alone with his personal conscience. In the second half of our century such views have become wedded to the ideas diffused by Marx: Christ is now described as a revolutionary who sets himself against the power of institutions which lead people into slavery and in this conflictóprimarily against the arrogance of the priestsóHe dies. In this way He is seen primarily as the Liberator of the poor from the oppression of the rich, one who wants to establish the “kingdom”, that is the new society of the free and equal. The image of Christ which we encounter in the Bible is a very different one. It is clear that we can consider here only those elements which immediately pertain to our problem. The essential factor in the image of Christ as handed on by the writings of the New Testament consists in His unique relationship with God. Jesus knows that He has a direct mission from God, God’s authority is at work in Him (cf. Mt 7:29; 21.25: Mk 1:27; 11:28; Lk 20:2; 24:19 etc.). He proclaims a message which He has received from the Father: He has been “sent” with an office entrusted to Him by the Father. The Evangelist John clearly presents this theme of Inc “mission” of the Son who proceeds from the Fatheróa theme which is always present, however, even in the so-called Synoptic Gospels. A “paradoxical” moment of this mission clearly appears in the formula of John which Augustine so profoundly interpreted: My doctrine is not mine… (7:16). Jesus has nothing of His own. except the Father. His doctrine is not His own. because His entire existence He is, as it were, Son from the Father and directed towards the Father. But for the same reason. because He has nothing of His own, everything that the Father has belongs to Him as well: “I and the Father are one” (10:30). The giving back of His whole existence and activity to the Father, an act through which He did not seek His own will (5:30). made Him credible, because the word of the Father shone through Him like light. Here the mystery of the divine Trinity shines forth which is also the model for our own existence. men, a figure which is continued after the Resurrection in the ministry of the Apostlesó that is, of the ones sent. Of great importance for our question is the fact that Jesus gave His power to the Apostles in such a way that He made their ministry, as it were, a continuation of His own mission. “He who receives you receives me”. He Himself says to the Twelve (Mt 10:40; cf. Lk 10:16; Jn 13:10). Many other texts in which Jesus gives His power to the disciples could here be cited: Mt 9:8: 10:1: 21:23; Mk 0:7: 13:34; Lk 4:6: 9:1; 10:19. The continuity between the mission of Jesus and that of the apostles is once again illustrated with great clarity in the Fourth Gospel: “As the Father has sent me. even so I send you” (20:21: cf. 13:20; 17:18). The weight of this sentence is evident if we recall what we said above concerning the structure of the mission of Jesus. As we saw, Jesus Himself, sent in the totality of His person, is indeed mission and relation from the Father and to the Father. In this light the great importance of the following parallelism appears: “The Son can do nothing of His own accord” (Jn 5:19-30). “Apart from Me you can do nothing” (Jn 15:5). This “nothing” which the disciples share with Jesus expresses at one and the same time both the power and the infirmity of the apostolic ministry. By themselves, of their own strength, they can do none of those things which apostles must do. How could they of their own accord say, “I forgive you your sins”? How could they say, “This is my body”? How could they perform the imposition of hands and say, “Receive the Holy Spirit”? None of those things which constitute apostolic activity are done by one’s own authority. But this expropriation of their very powers constitutes a mode of communion with Jesus, who is wholly from the Father, with Him all things and nothing without Him. Their own “nihil posse”, their own inability to do anything, draws them into a community of mission with Jesus. Such a ministry, in which a man does and gives through a divine communication what he could never do and give on his own is called by the tradition of the Church a “sacrament”. 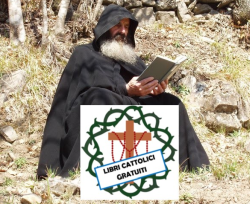 If Church usage calls ordination to the ministry of priesthood a “sacrament”, the following is meant: This man is in no way performing functions for which he is highly qualified by his own natural ability nor is he doing the things that please him most and that are most profitable. On the contraryóthe one who receives the sacrament is sent to give what he cannot give of his own strength; he is sent to act in the person of another, to be his living instrument. For this reason no human being can declare himself a priest; for this reason, too. no community can promote a person to this ministry by its own decree. Only from the sacrament, which belongs to God, can priesthood be received. Mission can only be received from the one who sendsófrom Christ in His sacrament, through which a person becomes the voice and the hands of Christ in the world. This gift of himself, this renunciation and forgetfulness of self does not however destroy the man; rather, it leads to true human maturity because it assimilates him to the Trinitarian mystery and it brings to life the image according to which we were created. Since we were created in the image of the Trinity, he who loses himself will find himself. But here we have got somewhat ahead of ourselves. In the meantime we have acquired a number of conclusions of great importance. According to the? Gospels, Christ Himself handed on the essential structure of His mission to the apostles, to whom He grants His power and whom He associates with His power. This association with the Lord, by which a man receives the power to do what he cannot do alone is called a sacrament. The new mission created in the choosing of 12 men has a sacramental nature. This structure flows, therefore, from the centre of the biblical message. It is obvious that this ministry created by Christ is altogether new and is in no way derived from the Old Testament, but arises from Jesus Christ with new power. The sacramental ministry of the Church expresses the novelty of Jesus Christ and His presence in all phases of history. After this brief exposition of the origin and the nucleus of the new ministry founded in Christ, we pose the question: How was all of this received in apostolic times? And above all: How did the transition evolve from the apostolic period into the post-apostolic period? Or in other words: How do we see reflected in the New Testament that apostolic succession which, after the Christological foundation, constitutes the second pillar of Catholic doctrine on New Testament priesthood? We can treat the first question briefly, because the testimony of St Paul above all is clear enough on this matter. With great clarity his vision of the apostolic office appears in that famous statement found in the Second Letter to the Corinthians: “So we are ambassadors for Christ, God making His appeal through us. We beseech you on behalf of Christ, be reconciled to God” (II Cor 5:20). God exhorts through the Apostle who is the ambassador of Christ. Here clearly appears that nature of the apostolic ministry which we have already learned constitutes the essence of “Sacrament”. This structure of speaking and acting not in one’s own name, but from divine authority appears again where Paul says: “As servants of God we commend ourselves in every way” (6:4). The substance of the apostolic ministry is also summed up where Paul speaks confidently of the “ministry of reconciliation” given to him (5:18). Reconciliation with God emanates from the cross of Christ and for this reason it has a “sacramental” nature. Paul presupposes that humankind is living in a state of “alienation” from itself (Eph 2:12). Only by union with the crucified love of Jesus Christ can this alienation of man from God and from himself be overcome, can man find “reconciliation”. This process of reconciliation took place on the cross of Christ. The death of Christ as a historical event is past; it becomes present to us in “sacrament”. In his First Letter to the Corinthians, the Apostle shows the enormously important role which the sacraments of Baptism and the Eucharist play in this process, together with the word of reconciliation which arouses faith and gives us a new birth. Corinthians: “This is how one should regard us, as servants of Christ and stewards of the mysteries of God” (4:1). example, he asks the Corinthians: “Shall I come to you with a rod, or with love in a spirit of gentleness?” (4:21). On the basis of this authority the Apostle may even make use of excommunication, “that the spirit may be saved in the day of the Lord Jesus” (5:5). The figure of the Apostle explained in this way has nothing in common with that “pneumatic anarchy” which some contemporary theologians attempt to deduce from the First Letter to the Corinthians and to present as the true image of the Church. From our analysis it is clear that the testimony of St Paul as to the apostolic ministry is in full accord with that which we have. already found in the Gospels; in the office of the “New Testament ministries” (II Cor 3:6) which we are speaking about, we see the same sacramental structure which is made known to us from the words of the Lord: The apostle acts from an authority which is not his own. he acts from the authority of Christ, not as a member of the community, but as one who stands before the community and addressing it in the name of Christ. This dialogical! structure pertains to the essence of revelation. Faith is not something which man thinks up on his own; man does not make himself a Christian by his own meditation or by his moral rectitude. Conversion to the faith always comes from without: it is a gift which always comes from another, from Christ, who comes forward to meet us. Where this “divine outside” is obscured, an essential structure of the Christian faith is in danger. Any community which would set itself up as Church or as ecclesial community would thereby destroy the dialogical mystery of revelation and the gift of grace which is always received from an “other”, from outside. In all the sacraments, the gift of God and man’s reception of this gift stand opposite each other. The same structure applies as well with respect to the Word of God: faith arises not from reading, but from hearing; the preaching of the Word through one who has been sent to preach belongs to the structure of the act of faith. Let us go on now to our second question: Does this ministry of the apostles continue after their death in an “apostolic succession” or is this office something unique which becomes extinct with the death of the apostles? As we look for a response to this highly disputed question, we should first of all remark that the meaning of the term “apostle” was still rather broad in the earliest days of the nascent Church. Only in the theology of St Luke. towards the end of the first Christian generation, is this title reserved to the 12 men chosen by the Lord. Other various ministries which are found at this time had not yet acquired a clearly definitive shape. Certain ministries appear which transcend the boundaries of the local communityó prophets and teachers, for example. Letter to the Philippians (1:1). Little by little, from these beginnings, there emerges a clearly defined structure of the ministries which by the end of the apostolic era had achieved initial maturity. This emerging maturity is attested above all by two famous texts of the New Testament which I would like to speak about briefly. In the first place, we should interpret the speech of St Paul to the presbyters of Asia Minor. This speech was given in Miletus and in the narrative of Luke it appears as the Apostle’s last will and testament. In the words here handed down, the principle of apostolic succession is clearly established. The Apostle says, according to the tradition of Saint Luke: “Keep watch over yourselves and all the flock of which the Holy Spirit has made you overseers. Be shepherds of the Church of God which He bought with His own blood” (Acts 20:28). Various elements should be looked at here. First of all, two notions which up until this point were unconnected, that is, “presbyter” and “bishop”, are here equated; the traditions of Christians stemming from a Jewish background and those of Christians who entered from paganism coalesce and are explained as a single ministry of apostolic succession. It is the Holy Spirit who introduces one into this ministry which in no way comes from the delegation of the community, but is rather the gift of God, who through His Spirit “sets up bishops”. Because this gift is conferred by the Spirit it has the dignity of “sacrament”. The duty of the Apostles to feed the flock of Christ is thus continued. The apostolic structure sends us back to the mystery of Christ, the true Shepherd, who bought His flock “with His own blood”. In these words not only do the traditions of Jewish and Gentile Christians coalesce, but above allóand this is of even greater importanceóthe ministry of priests and bishops as to their spiritual essence is clearly shown to be the same as the ministry of the apostles. St Luke distinguishes this essential identity which constitutes the principle of apostolic succession by means of a formal difference: because he designates only the Twelve by the term “Apostle”, we are able to distinguish between the unique nature of the original office and the permanent nature of the succession. In this sense, the ministry of the presbyters and bishops is different from the mission of the Twelve Apostles. Presbyters/bishops are successors, but the apostles themselves are not. A certain “once” and also a certain “always” pertain to the structure of revelation and of the Church. The power given by Christ to reconcile, to feed and to teach continues unaltered in the successors, but these are true successors only if “they devote themselves to the apostles’ teaching” (Acts 2:42). unfading crown of glory”. Already in the first words of this apostolic admonition we find an expression of the identity of the apostolic and the presbyteral ministry which is of great importance: the Apostle calls himself “co-presbyter”, and in this way establishes a theological link between the ministry of the apostles and that of the presbyters. The theology of the apostolate which we looked at in the first section is here transferred to the presbyterate, and in this way a genuine New Testament theology of priesthood is born. By calling himself co-presbyter with the presbyters, the Apostle is acknowledging that they are constituted in the same ministry as he, and he is thus clearly establishing the principle of apostolic succession. Another aspect of great importance in answering our question may be found in this short text. Just as in the speech at Miletus, about which we spoke above, so here too the nature of the apostolic office is summarized in the term: “Feed”, which is a term taken from the imagery of the pastor, the shepherd. The significance of this expression is illuminated by the fact that the Apostle towards the end of the second chapter (2:25) designates the Lord as the “shepherd and bishop of your souls”. Here in the fifth chapter, he follows the same mode of speaking when he calls Christ the Chief of shepherds. The Apostle, aware of the etymological meaning of the term “bishop”, that is, a guard, one who is in charge, who provides, sees this meaning as coinciding with the term “pastor”, shepherd. In this way the formerly secular term “bishop” begins to refer to Christ the Shepherd, and a new Christian terminology appears together with a new “sacrality” of the Christian faith. Just as the term “co-presbyter” linked the Apostles and their successors the presbyters together, so the term “bishop” refers those successors to Christ and reveals the Christological foundation of the episcopal and presbyteral ministry. It must be said, therefore, that towards the end of the apostolic era in the writings of the New Testament an explicit theology of New Testament priesthood appears. This theology is entrusted to the faithful hands of the Church and constitutes the inalienable core of every theology of Christian priesthood for the rest of time. that Christians become partakers through Baptism of the privileges of the People of God. What happened on Mount Sinai becomes present in a new way in the Sacrament of Baptism. The Church of Christ in her totality is the living temple where God dwells and is rightly worshipped. Through the ministry of the Church, the world is united for the worship of the true God. St. Paul says the same thing in other words in his Letter to the Romans, where he himself speaks as the “minister (leitourgon of Christ Jesus to the Gentiles in the priestly service (hierourgounta) of the Gospel of God, so that the offering (he prosphora) of the Gentiles may be acceptable, sanctified by the Holy Spirit” (Rom 15:16). It is clear then that the common priesthood of the baptized, which follows from their entrance into the history of God’s covenant initiated on Mount Sinai and renewed in the cross of Christ, is in no way opposed to the ministerial priesthood, just as the common priesthood of the people of Israel was never set in opposition to its priestly orders. From these observations it is also clear in what sense the ministry of apostolic succession is something truly new and in what sense this Christian novelty incorporated the preparatory figures of the Old Testament. On the one hand, the apostolic ministry of the Church is new, because Christ is new from whose words, life and death this ministry flowed. On the other hand, Christ who makes all things new, at the same time fulfils all the figures which throughout history led up to Him. For this reason the new priesthood of the apostles of Jesus Christ and of their successors carries within itself everything which was prophetically contained in the Old Testament. This becomes very clear when we consider the formula which John Colson, after a very careful analysis of the sources, employs to define the nature of Old Testament priesthood. “The essential function of the kohanim (hiereis, priests) is this: to keep the people aware of its priestly character and to labour that it may live as such and glorify God by its whole existence”. How close this formula is to the words of St Paul mentioned above is evident. However, the new missionary force proper to the Christian priesthood follows from the fact that Christ on His cross “has broken down the dividing wall” (Eph 2:14), bringing near in His blood those who once were far off (ibid., 2:15). The priesthood of the New Testament, therefore, has this as its aim: that the whole world may become a temple and a sacrifice pleasing to God, that in the end God may be all in all (cf. I Cor 15:28). How these biblical foundations of the ministerial priesthood are to be applied to priestly formation in the circumstances of today is a topic to be discussed by the Synod. I cannot anticipate its conclusions, nor do I wish to do so. I take the liberty to offer but a few brief suggestions. We have seen that the priesthood of the New Testament, which appeared first in the apostles, presupposes a true communion with the mission of Jesus Christ. The person who becomes a priest is grafted into His mission. For this reason, an intimate personal relationship with Christ is fundamental for priestly life and ministry. All priestly formation should lead to the fostering of this relationship. The priest should be a person who knows Jesus intimately, has met Him and learned to love Him. The priest should therefore be a man of prayer, a truly “spiritual” man. Without strong spiritual substance he cannot last in his ministry. From the mystery of Christ he should also learn in his life not to seek himself nor his own promotion. He should learn to spend his life for Christ and for his flock. Such a way of living is opposed to our natural inclination, but little by little it becomes clear that only he who is capable of forgetting himself is truly free. One who works for Christ learns by experience that one sows and another reaps (cf. Jn 4:56). He has no need to look for success and thus have to rely on himself. Since he is working for the Lord, he leaves the outcome to the Lord and in joyfulness of spirit he places his concerns in the hands of the Lord. When we seek our own success, the priesthood begins to appear as a burden which surpasses our strength, and burdens too heavy for our shoulders to bear are the inevitable result. But Christ carries us in faith, and from our union with Christ an invincible joy arises which proceeds from the victory of Christ, who conquers the world (Jn 16:55) and is with us to the very end of time (Mt 28:20). From an intimate union with Christ there automatically arises also a participation in His love for human beings, in His will to save them and to bring them help. He who knows Christ from within wishes to communicate to others the joy of the redemption which has opened up for him in the Lord: pastoral labour flows from this communion of love and even in difficult situations is always nourished by this motivation and becomes life-fulfilling. He who loves wishes to know. A true love of Christ, therefore, expresses itself also in the will to know Him and everything that pertains to Him. Since the love of Christ necessarily becomes love of human beings, education to the ministry of Christ includes also education to the natural human virtues. Since to love Him means to know Him, it follows that a will that is eager to study carefully and diligently is a sign of a solid vocation. Because Christ is never alone, but comes to gather human beings into His body, a love for the Church must necessarily accompany a love for Christ. Christ has willed to come to us in the community of His Church. In a person’s zealous love for the Church, his relationship with the Lord Himself is revealed as intimate and strong. teaching” (Hom. in Ez. lib I, hom V, 16 PL 76, 828 B).